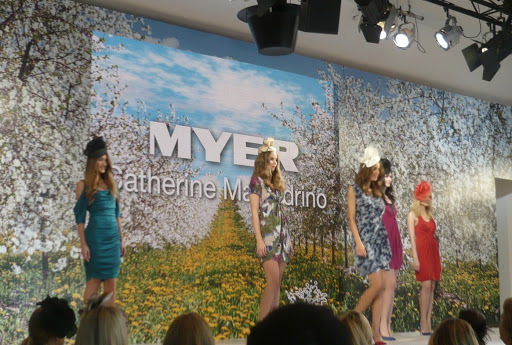 Spring fashion lunch at Flemington on Thursday… a very fancy affair where we all got to dress as if we were trackside and enjoy lunch and a racewear fashion show courtesy of Myer. 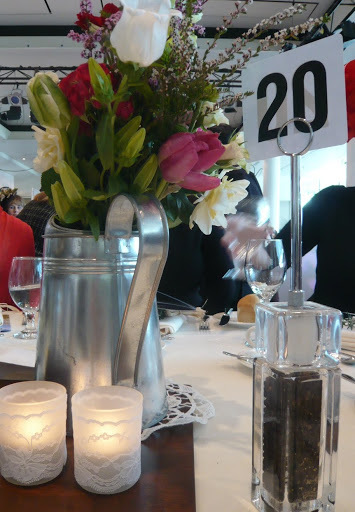 There was a bit of a lace theme for the table settings… not sure if you can see but there is lace wrapped around the candle holders, an easy idea that home decorators could try for their next party! 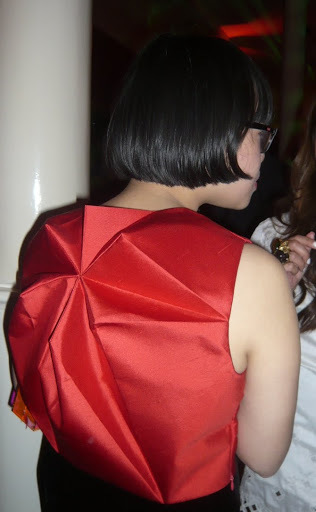 I didn’t have much warning about the event and didn’t even realise I was meant to wear racewear until the day before, so had no time to fiddle around putting outfits together and just had to go with one I made two years ago (more info on it here). I also had no idea that my rellies were going to be there! Bumping into them was a nice surprise! I also bumped into Lady Melbourne who has put much better pictures and more info about this event on her blog if you want to take a peek. She’s wearing EYELASHES with horse shapes cut out of them. Talk about being up to your eyeballs in spring racing! 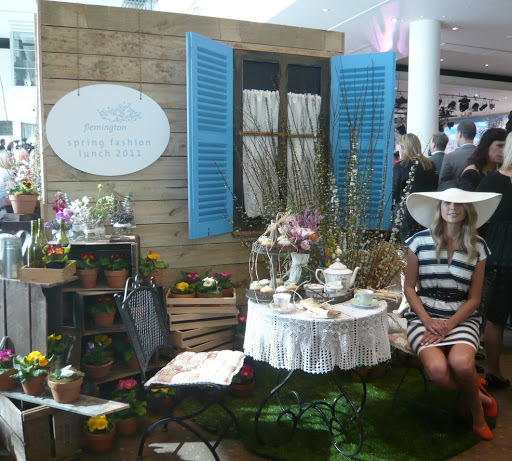 I got the feeling that most of the ladies at the lunch were enjoying themselves but had not gone all out with their frocks and hats, because after all, the racing season has not really kicked off and you don’t want to show off your best outfit just yet. I’m not sure how this lady is going to do much better than this hat though. 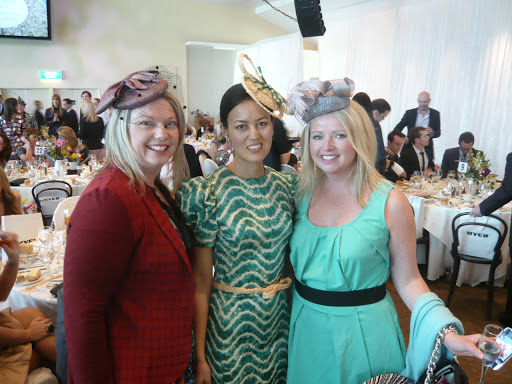 She was definitely one of the most stylish ladies at Flemington! 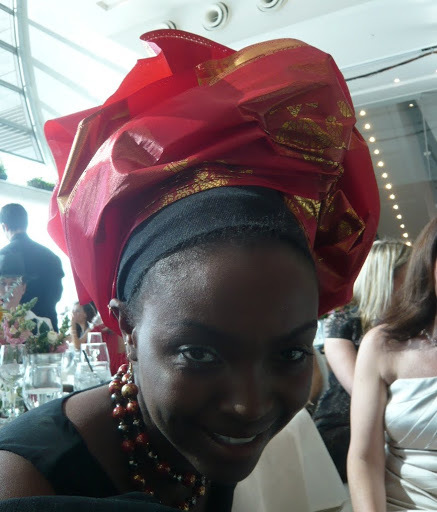 Her headwear is by Yaka Yeke Designs from Kenya. After the lunch, it was back to work for a few hours before heading out again to the Camilla and Marc store opening in High Street, Armadale (got to chat with both the designers, and they were both lovely!) 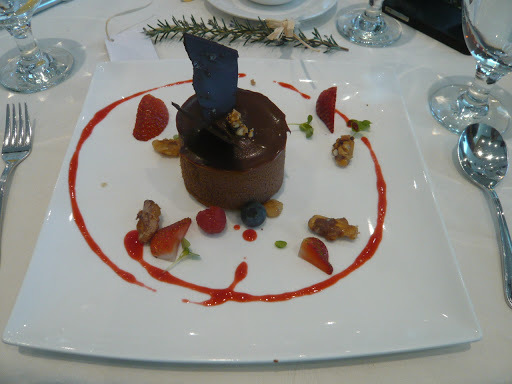 and the Stonnington Gala … after three events in one day I was just a tad tired! But pre-fashion week madness waits for no man (nor woman, as the case may be) and on Friday I went to the fashion week launch party in the Georges building. 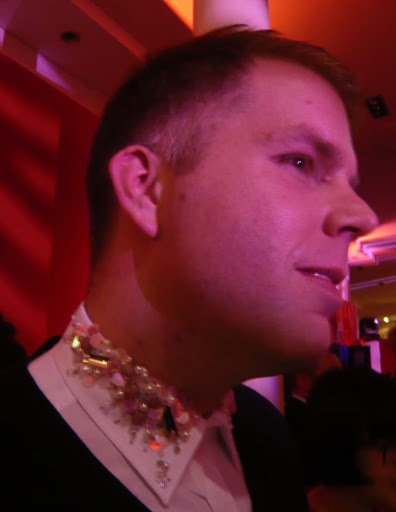 There was bling everywhere, including on Gavin Lowe’s collar – he’s one of the designers behind label Neo Dia but just to confuse people he’s wearing a shirt by Pamela Usanto. He was with this lady (who I assume is his partner in crime, Becky Chua, as she is wearing an insanely clever top by Neo Dia: more on them here if you’re interested, and you should be!). Never underestimate the incredible impact you can make as you exit a room, folks! And on that note, I think it’s time I was out of here. Beauty sleep coming up!